It's the time of year when the market stalls are full of Artichokes. So many different varieties (there are over 90) coming from all parts of Italy. While I await the arrival my most favoured artichoke from Albenga, these spikey Ligurians are a good alternative. I suppose the most intimidating part of artichokes tends to be their preparation but it needn't be. The key is to have a bowl of acidulated water - a simple mix of cold water and lemon, you could use vinegar but I feel lemon is a better match for artichokes. To stop staining your fingers, wearing gloves is an easy fix - you could also rub your fingers and hands in lemon juice but it's a little messy. Once you've cleaned the artichokes, drop them in the acidulated water to stop them from discolouring and only pull them out once you're ready to make the dish. My other bit of advice is - Don't throw away the stems! 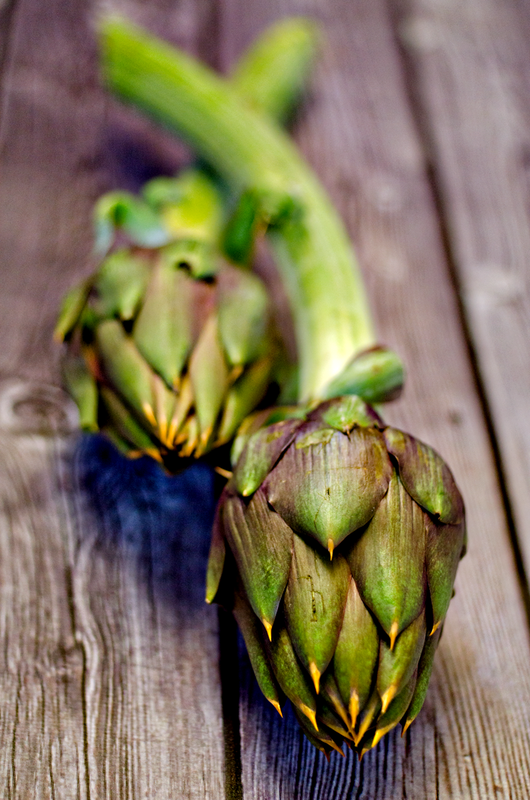 When buying artichokes I choose the ones with the longest stems because they are a treasure. See that white core - that can be one of the best parts. 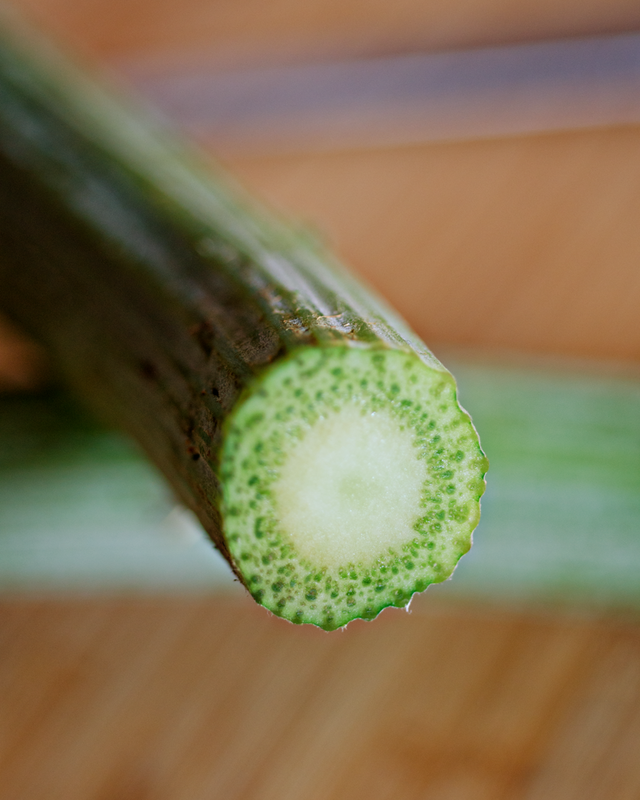 All you need to do is peel away that stringy green layer that surrounds it. Depending on the variety of artichoke, the stem can be eaten raw - it can be crisp and juicy like an apple - or just by boiling it can be served as a side dish. I recently enjoyed them boiled and then gently rolled in a lemony butter sauce. 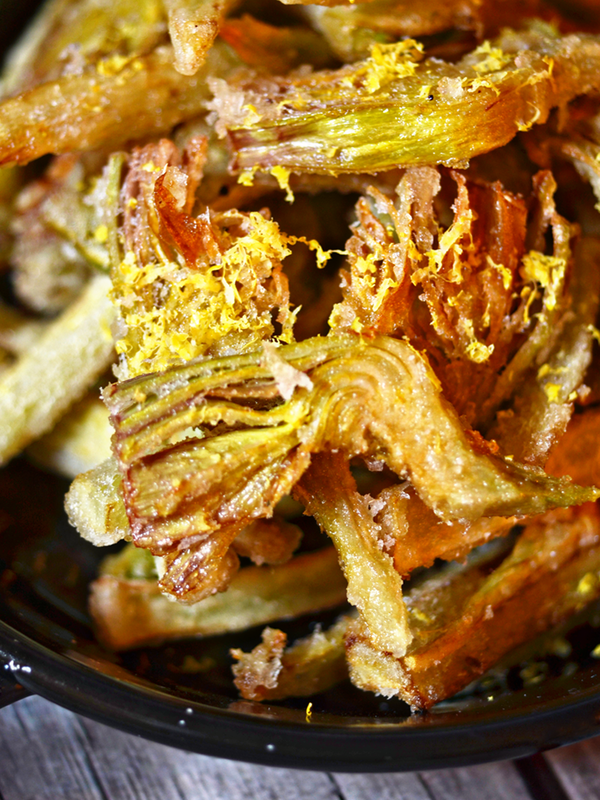 The dish I've presented can be made with just about any variety - a simple dish of Carciofi Fritti or Fried Artichokes. 1. Prepare the artichokes. I've used both the head and the stem. Once cleaned place them in the acidulated water. Proceed to step 2 when you are ready to cook them. 2. Remove the artichokes from the water and slice very finely. 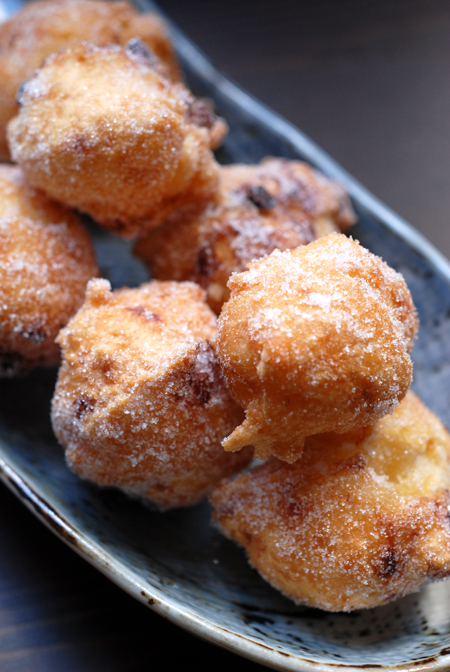 Place in a bowl and sift over with a little potato flour - just the lightest of dustings. Toss until all the pieces are coated. I use potato flour because it isn't as heavy as wheat flour and as an added benefit is gluten-free. Rice flour tends to be too assertive. 3. Shallow fry until golden - they should take less than a minute. It's important when frying not to overcrowd the pan. Once golden, place on paper towels to remove any excess oil. 4. To Serve - tumble into a dish and then finely grate lemon zest over the top. Season with sea salt flakes and freshly milled pepper as desired. I find the lemon peel really adds a lovely freshness to the dish.